Theresa's Haunted History of the Tri-State: Happy Paranormal Day! Seriously, its a real holiday...at least, its as real as the other bizarre holidays this month, such as Lost Sock Memorial Day! Paranormal Day might not be well recognized, but its an opportunity for lovers of the strange and unusual to band together and share our love with those around us! 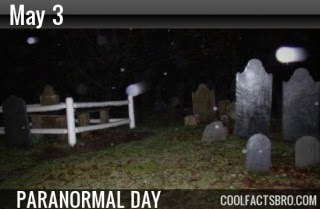 It is a day to bring much needed recognition and validity to field of paranormal research, as well. There are numerous ways to celebrate this wonderful holiday and to get you started, I've included eight simple spooky activities, perfect for today or ANY day really! Join me over on Theresa's Haunted History Facebook page and let me know how you're celebrating. 1. Watch a spooky, ghost-themed movie...but not necessarily a horror flick. There are so many good movies out there that feature ghosts and other paranormal elements, many of which can be watched for FREE on Youtube, or through popular streaming services, such as Netflix. To get you started, you can check out my article on Paranormal Investigation Movies. If movies aren't really what you're in the mood for, you can watch a few episodes of your favorite paranormal television show, instead. And...if you are of legal age and are so inclined, you can check out my blogs for DRINKING GAMES of two popular series, Ghost Hunters and Ghost Adventures. 2. Read a book! Fiction or non-fiction, its your choice...just make sure there are some elements of the paranormal in there somewhere! If you have a Kindle, there are plenty of awesome choices out there for FREE download from Amazon. You can check out my recommendations HERE, or go to my Book Reviews page for plenty of non-fiction choices, mostly featuring tri-state area haunts. 3. Tell ghost stories. Get together with friends and families over a bonfire or in front of the fireplace and see who can tell the creepiest story. See if you can guess which stories are made up...and which ones are completely TRUE! You can even turn it into a game---several years ago, my friends and I got together to play a game called 100 Candles. It's an old Japanese ghost story game in which 100 candles are lit. The guests take turns telling ghost stories, blowing out a candle at the conclusion of each tale. When all 100 candles are blown out, it is said that the darkness around you will be filled with all 100 ghosts from the tales. You'll probably get bored well before reaching 100 stories, but its a fun opportunity to get together with friends, pig out, and have fun. 4. Visit a haunted location! Many historical places open to the public have at least one or two ghost stories attached. Eat dinner at a haunted restaurant, tour a haunted museum, stay the night in a haunted hotel, bowl a game at your favorite haunted bowling alley, take in a show at a haunted theater, or simply take a leisurely drive down a haunted road. Read up on the haunted history of your chosen spot, then keep your eyes and ears open for anything strange. Don't forget to bring your camera and take lots of pictures---you never know who might show up in your shots. 5. Do a little paranormal investigating for yourself! Don't belong to a group....no problem. There are plenty of locations that offer public ghost hunts, such as Trans-Allegheny Lunatic Asylum and the WV State Penitentiary. Can't afford the big name pay-to-play locations? Also not a problem! Just grab a few friends, a camera and a cheap voice recorder and check out any local haunted hot spots, such as cemeteries or parks. Just make sure you get permission to be there and practice good behavior. You can read my article on Outdoor Investigation Tips to give you some ideas. 6. Get a psychic reading. Whether or not you believe that anyone has the ability to tell the future, its always a little fun to see how eerily accurate (or totally off-base) your reading can be. 7. Are you more of a studious type? Get educated! Take a class related to the paranormal field, such as genealogy or photography...there are some great FREE choices online, but you can also find one local to your area. You can also take Fiona Broome's FREE Ghosts 101 class, which comes with a certificate of completion. Don't have the time to commit to an actual class? Youtube is full of wonderful lectures from a variety of speakers on a variety of paranormal topics. I've even found a few TEDx videos dealing with paranormal topics, such as a talk by Jeff Belanger on haunted places! 8. Turn Paranormal Day into a Day of Service. Way back when I first heard of Paranormal Day (I believe about 8-9 years ago) it was being touted as a day of service, a way for the paranormal community to not only recognize the field as a legit field of study, but as a way to give back to the community. This is a perfect opportunity to volunteer as a team, or individually, and give it a paranormal spin! Do you have a historic cemetery nearby that could use some work? Get with the owner to see what can be down about mowing, trimming, cleaning up debris, etc. However, don't undertake any preservation work or cleaning of tombstones unless you are properly trained to do so. If there is a historic building near you, check with the owners to see if there is anything you can do to help. Again, light yard work, such as mowing and trimming, might be needed, but perhaps they need volunteers to help with historic tours, cleaning up inside, or office work. You can also make a monetary donation to these types of locations for their upkeep, if that's more your style.